Warm, sweet and absolutely delicious, moong dal halwa is a treat for all senses. A traditional Indian dessert pudding made by roasting yellow moong dal in plenty of ghee and then cooking with milk, sugar, cardamom and lots of dry fruits. Golden yellow in colour and rich with dry fruits, saffron and cardamom, it is the centre piece of any meal it is added to. I have fond childhood memories of moong dal halwa. It was usually prepared in winters as is with most warm sweets. 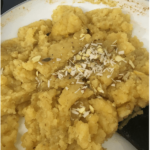 My grandmother used to make it on extra special occasions because unlike aate ka halwa or Gajar ka halwa, moong dal halwa recipe is a bit involved and needs almost an hour of continuous cooking. But every minute of it is worth it. All of us used to start drooling half way through the preparation as the aroma of moong dal roasting in ghee travelled from the kitchen. If we knew in advance that today grandma is going to make moong dal halwa, nobody ate anything for breakfast! I had never embarked on the journey of cooking moong dal halwa because of all the stirring that I have seen dadi doing every time she cooked it. But as luck would have it, Sikander’s favourite dessert is Moong dal halwa and another sweet called monthal, which is also made of yellow moong dal. I could stay away from cooking it for just about 4 years of our marriage :-). As was in my childhood, moong dal halwa is reserved for extra special occasions in my home too. Diwali being one of them but this time the special occasion came a little earlier. Last week when Sikander came to India, I was meeting him after a month. Seeing my dear husband after a month is always a special occasion and so we celebrated with a big bowl of golden moong dal halwa. It is a bit high on calories so I would suggest do reserve it for special occasions :-). 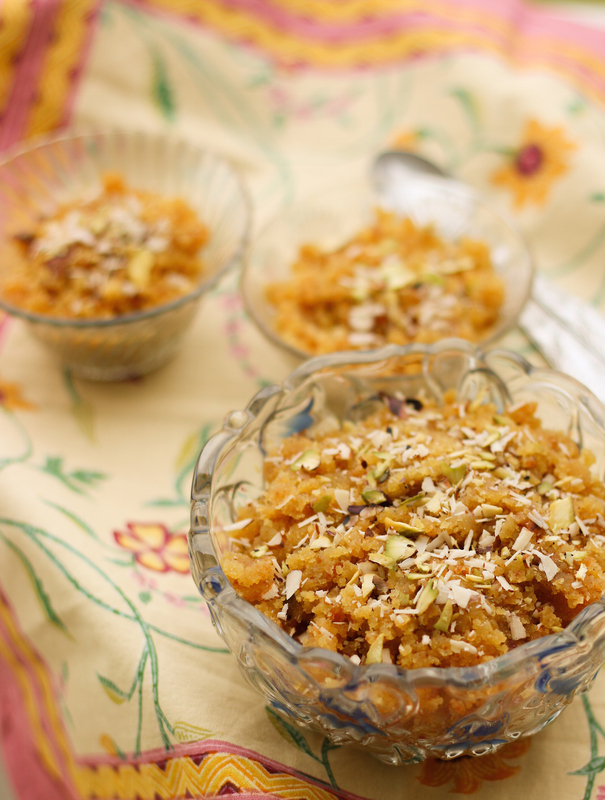 Warm, sweet and absolutely delicious, moong dal halwa is a treat for all senses. A traditional Indian dessert pudding made by roasting yellow moong dal in plenty of ghee and then cooking with milk, sugar, cardamom and lots of dry fruits. Drain the soaked dal and grind to a fine paste adding a little water. Heat ghee in a non-stick pan on medium-low heat and once the ghee is hot, slowly add the moong dal paste. 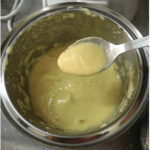 I actually forgot the non-stick part and used a traditional kadhai but as soon as I started mixing the moong dal paste with the ghee, it started to stick and I had to transfer the contents to a non-stick pan. In a separate pan, bring the milk and sugar to a boil. Keep aside. Keeping the heat at medium-low, cook the moong dal paste in ghee till it becomes very granular and you can start to smell the aroma of roasted dal. You need to stir it frequently to ensure uniform cooking. Takes about 20 mins. Slowly add the sweetened milk from a side. Be very careful in this step as the milk will sputter as you add it to the hot pan. Dissolve saffron in 2 tbsp warm water. Mix well and continue cooking at medium-low heat with frequent stirring till the entire milk is absorbed by the dal. Takes about 30 mins. Add the saffron water, 1 tbsp cardamom powder and half of the dry fruits. Mix well and cook on low for another 15 mins till the halwa leaves ghee on the sides. Add the remaining cardamom powder. Empty in a bowl and garnish with the remaining dry fruits. In place of sugar, you can also use jaggery. 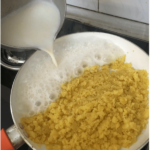 If using jaggery, grate it before adding to milk and stir it continuously till it dissolves well in the milk. 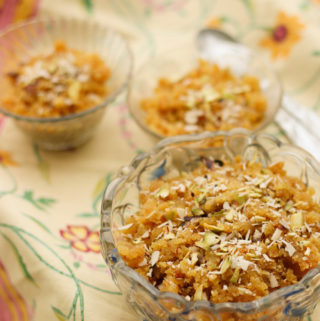 Moong dal halwa can be made a day in advance. It keeps well in refrigerator. Heat it before serving. This recipe is worth every minute and every stir of your hand. 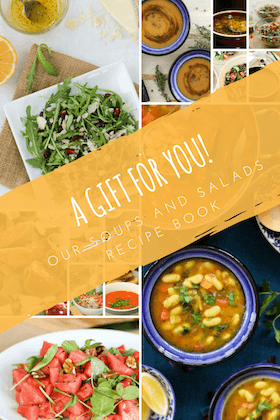 Make it to celebrate a special occasion or turn a normal day into a celebration.